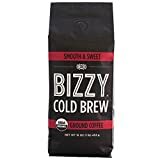 Bizzy Cold Brew Coffee is a concentrated cold brew coffee made in Minnesota. There are six (2.7 fl oz) servings in a bottle of Bizzy with each delivering 125 mg of caffeine. 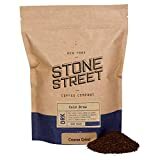 Above we list the caffeine content of the whole bottle because it is important that people understand the importance of only drinking the amount of Bizzy that would be safe daily based on a person's body weight and sensitivity to caffeine. Bizzy can be consumed both hot and cold as well as added to milk according to the consumer's preference. 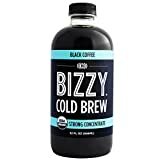 Available from Amazon / Inspired Coffee Co.
Bizzy Cold Brew contains 46.88 mgs of caffeine per fluid ounce (158.50mg/100 ml).